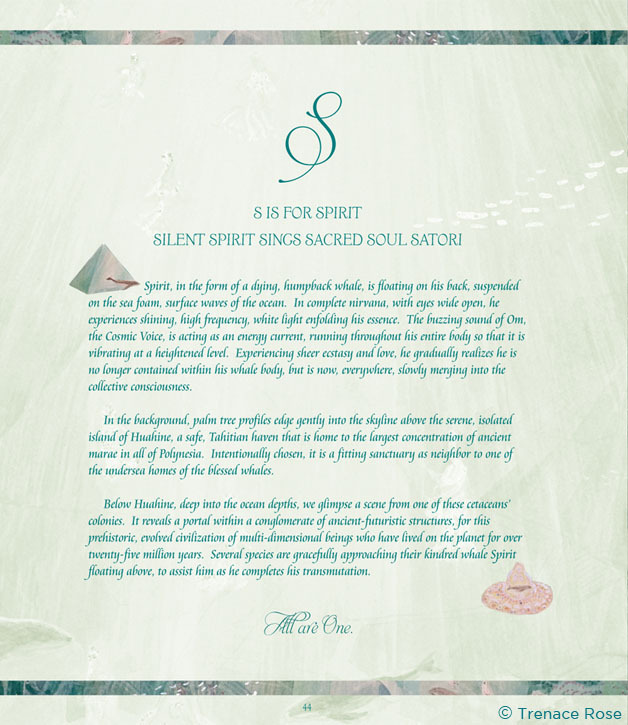 Experience the astral realm: As you review the interior samples of text and paintings, you will receive the extraordinary healing vibration that has been passionately infused into every page of the book. It is the 21st Century. 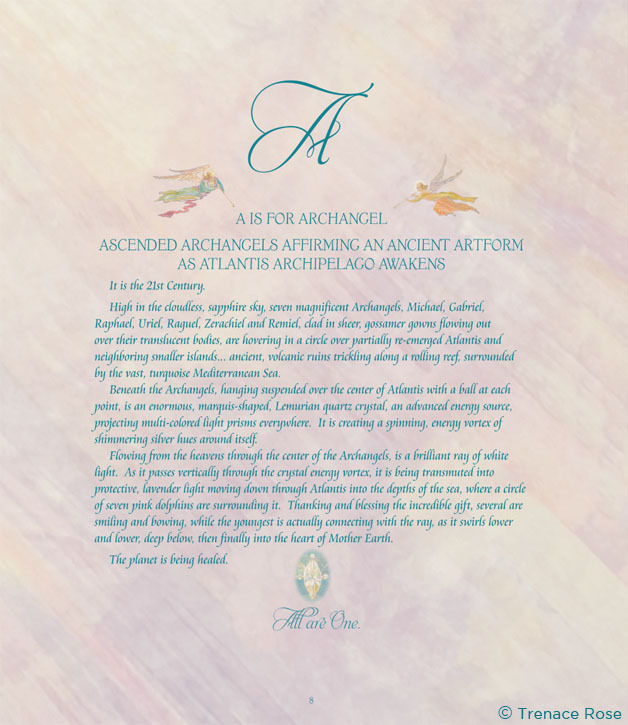 High in the cloudless, sapphire sky, seven magnificent Archangels, Michael, Gabriel, Raphael, Uriel, Raguel, Zerachiel and Remiel, clad in sheer, gossamer gowns flowing out over their translucent bodies, are hovering in a circle over partially re-emerged Atlantis and neighboring smaller islands… ancient, volcanic ruins trickling along a rolling reef, surrounded by the vast, turquoise Mediterranean Sea. 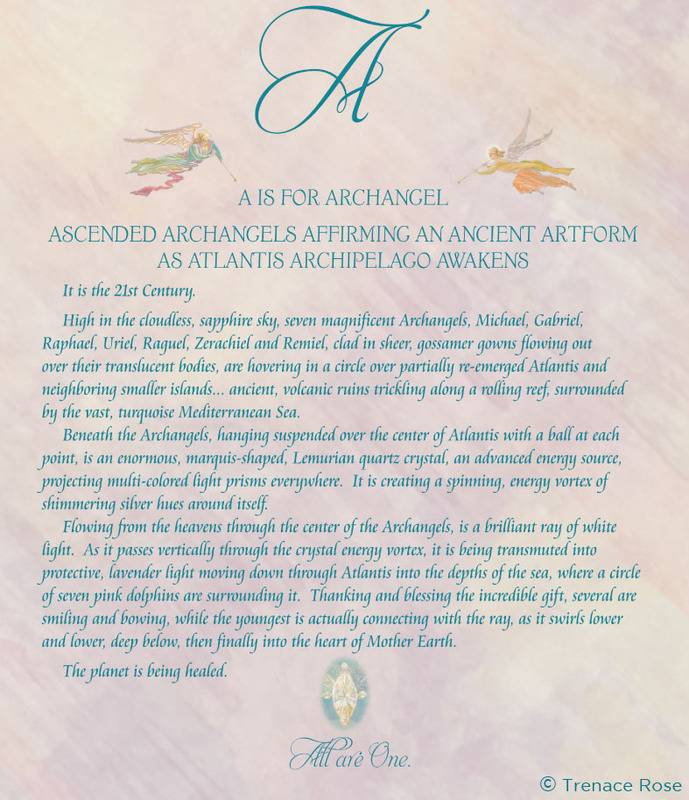 Beneath the Archangels, hanging suspended over the center of Atlantis with a ball at each point, is an enormous, marquis-shaped, Lemurian quartz crystal, an advanced energy source projecting multi-colored light prisms everywhere. It is creating a spinning, energy vortex of shimmering silver hues around itself. 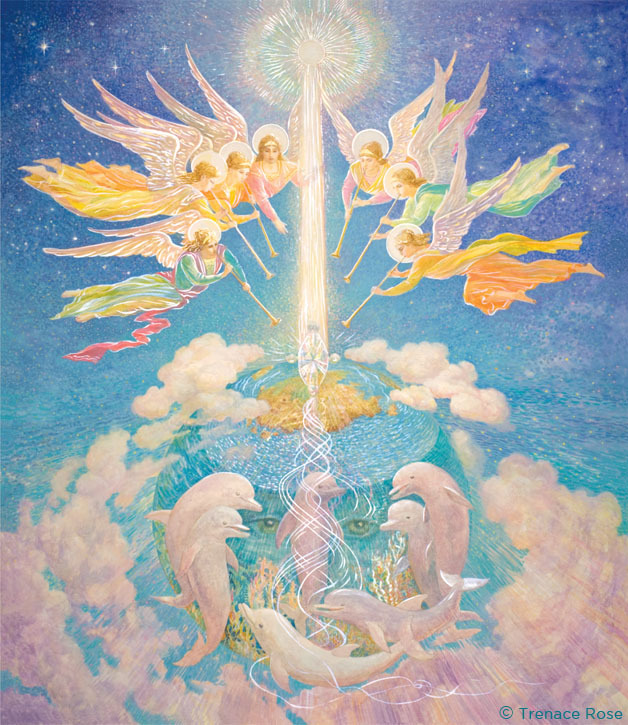 vertically through the energy vortex, it is being transmuted into protective, lavender light, moving down through Atlantis into the depths of the sea, where a circle of seven pink dolphins are surrounding it. 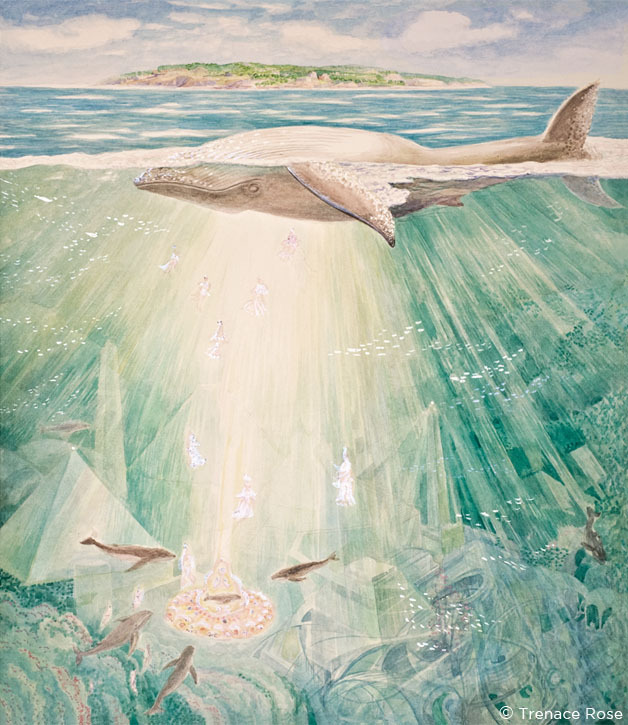 Thanking and blessing the incredible gift, several are smiling and bowing, while the youngest is actually connecting with the ray as it swirls lower and lower, deep below, then finally into the heart of Mother Earth. The planet is being healed. 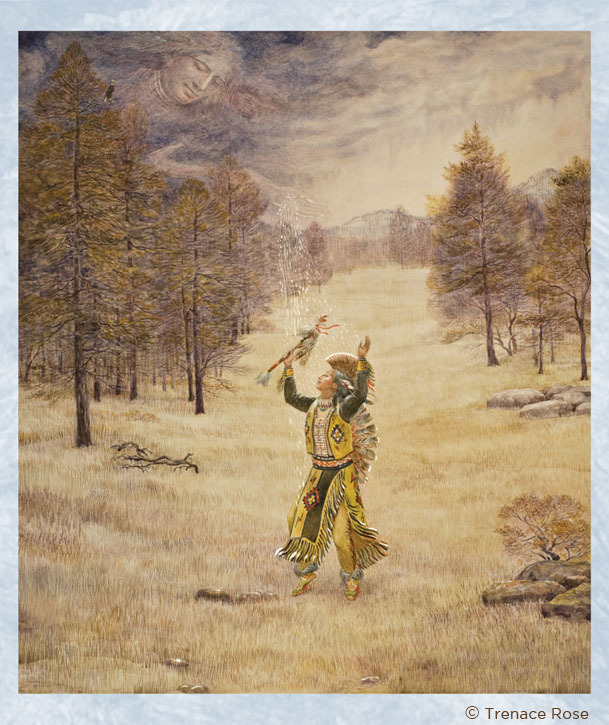 A Kumeyaan Indian Chief, dressed in his glorious, full native attire, is slowly, intensely dancing in a long-dry, withered crop field in Cuyamaca, California. His face is turned upward and with closed eyes, he is humbly smiling into the giant face of an approaching dark cloud, as rain droplets of karma finally begin to sprinkle down upon him. He is receiving the precious water gift with grace, feeling the cool moisture, his arms outstretched, with thankful humility and ultimate relief. 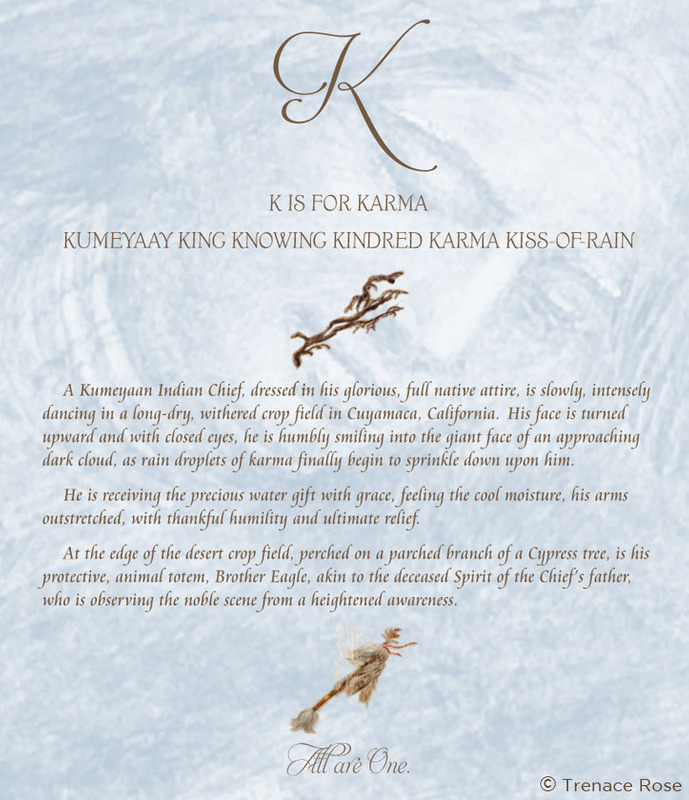 At the edge of the desert crop field, perched on a parched branch of a Cypress tree, is his protective animal totem, Brother Eagle, akin to the deceased Spirit of the Chief’s father, who is observing the noble scene from a heightened awareness. 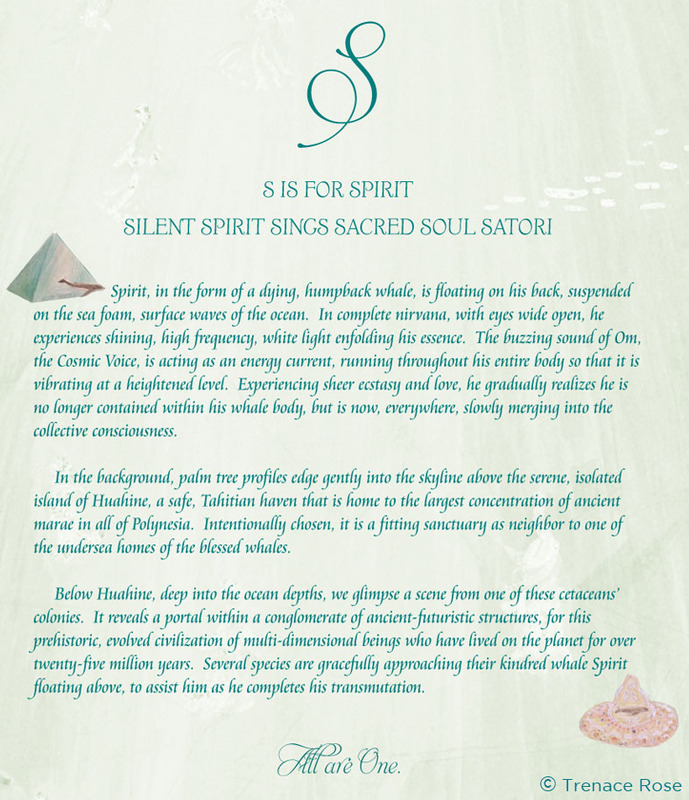 Spirit, in the form of a dying, humpback whale, is floating on his back, suspended on the sea foam, surface waves of the ocean. In complete nirvana, with eyes wide open, he experiences shining, high frequency, white light enfolding his essence. The buzzing sound of Om, the Cosmic Voice, is acting as an energy current, running throughout his entire body so that it is vibrating at a heightened level. Experiencing sheer ecstasy and love, he gradually realizes he is no longer contained within his whale body, but is now, everywhere, slowly merging into the collective consciousness. In the background, palm tree profiles edge gently in the skyline above the serene, isolated island of Hauhine, a safe, Tahitian haven that is home to the largest concentration of ancient marae in all of Polynesia. Intentionally chosen, it is a fitting sanctuary as neighbor to one of the undersea homes of the blessed whales. Below Hauhine, deep into the ocean depths, we glimpse a scene from one of these cetaceans’ colonies. It reveals a portal within a conglomerate of ancient-futuristic structures, for this prehistoric, evolved civilization of multi-dimensional beings who have lived on the planet for over twenty-five million years. Several species are gracefully approaching their kindred whale Spirit floating above, to assist him as he completes his transmutation. 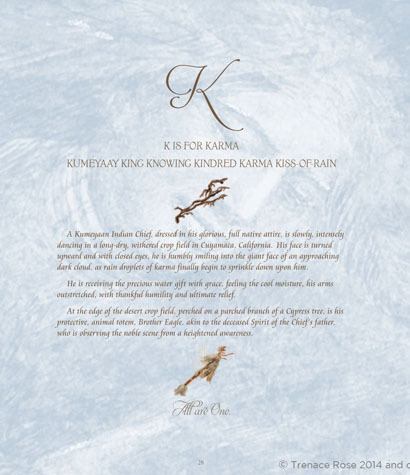 It is respectfully requested that this website content not be reproduced in whole or in part, stored in a retrieval system, or transmitted in any form or by any means electronic, mechanical, or other, without the written consent from the copyright holder, except by a reviewer, who may quote brief passages in a review.